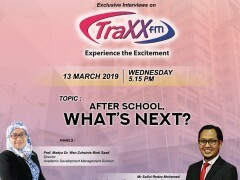 We are so proud to share that our senior counselor Br Saiful Redza was on air with TraxxFM to talk about way forward after the SPM and STPM. He was partnered with Assoc Prof. Dr. Zuhanis, a director of Academic Development Management Division, Ministry of Education Malaysia (Higher Education). The interview was hosted by DJ MrTerrence Dass. The interview was conducted on 13th March 2019 at 5.15pm.